Literally running its course and debuting what is literally just a fantastic episode that opens the doors for “infinite possibilities” in both the new season and The CW DC TV Universe as a whole, the second episode of The Flash is nothing short of EXTRAORDINARY, and is a first in a lot of ways since it practically introduces the concept of the “Multiverse” properly and for the very first time in a live-action DC Universe setting. It’s a great nod to the legendary issue that is “The Flash #123”, which debuted in 1961 and featured for the very first time two different speedsters from two alternate worlds teaming up to save the day and be what they are – Heroes. So it’s quite apt that Episode 2 shares the same title as the issue’s story – “Flash of Two Worlds“, and properly introduces us to one of the newest speedsters to run alongside Barry Allen in the fight for justice in Jay Garrick, aka The Flash of Earth Two. Brace yourselves, dear readers, as another RECAP begins with SPOILERS discussed and named. Previously on the season 2 premiere episode of The Flash, Barry Allen mended fences and reestablished ties “Team Flash”, whom he alienated after the events of the “Singularity” six months ago which caused the deaths of Eddie Thawne and Ronnie Raymond/ Firestorm. After successfully stopping a rogue metahuman called “Atom Smasher” with the help of his teammates, Barry Allen was ready to resume hero duties and accept the help of his friends… Until a wild card appeared out of nowhere inside the new and “highly secured” S.T.A.R. Labs with one Jay Garrick – who says he’s from a parallel world and warns Team Flash that their world is in danger. After confirming that the Al Rothstein/ Atom Smasher they encountered was from his world, Jay begins to relate to Team Flash the events leading to his arrival and the danger that threatens their world in the form of “Zoom” – an evil speedster whose goal to eliminate The Flash and become the only “Fastest Man Alive” in the entire universe. Not taking his word for it as well as the fact that he has lost his speed, Barry and the rest decide to run tests on Jay and see if he’s telling the truth or otherwise. The concept of parallel universes and a “Multiverse” is fascinating to Dr. Martin Stein and Cisco, but Barry is wary and faces trust issues with Jay. Despite Mr. Garrick offering his help in dealing with a new metahuman from his world called “Sand Demon“, Mr. Allen is hesitant since Jay reminds him so much of his former mentor and enemy Harrison Wells/ Eobard Thawne, aka the Reverse Flash. Despite his reservations about trusting a man he barely knows, Sand Demon’s presence and campaign to find and kill The Flash forces Barry to put those feelings aside and trust Jay. Teaching him a new ability called “Force Lightning” to use against his new foe, Barry and Jay hatch up a plan to deal with Sand Demon and officially team up as “Flash of Two Worlds”. They successfully stop the threat and rescue Joe West’s new partner in the “Anti Metahuman Task Force” in one Patty Spivot, who has her own reasons for wanting to make a difference in protecting Central City. Overall, this second episode of The Flash’s new season is just WONDERFUL. DC Comics fans who have been praying for acknowledgement of the Multiverse finally have it… And the possibilities are endless for what’s to come for the rest of the season and what exactly Barry Allen and his friends will be facing now that alternate and different worlds from their own enter the equation. 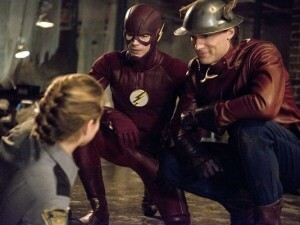 What’s more, new supporting cast members like Teddy Sears’ Jay Garrick and Shantel VanSanten’s Patty Spivot are more than welcome. 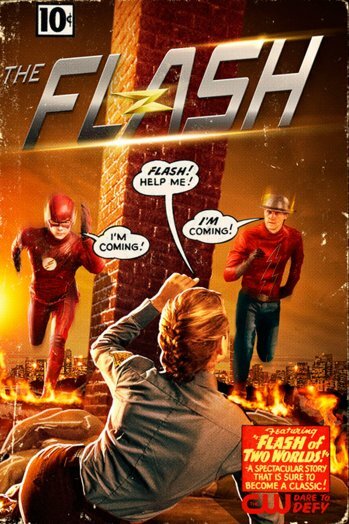 Sears adds his own layer of awesome by playing a powerless yet very wise Flash of Earth Two. He’ll eventually be getting his speed back no doubt, but it’s great to see a mentor role in him training a still up and coming Flash of Earth One, and Sears’ presence and the way he carries himself is reminiscent of John Wesley Shipp’s time as The Scarlet Speedster in the 90’s Flash TV Show. As for VanSanten’s Patty Spivot, she makes a great romantic interest to Barry, and that Monty Python reference was just gold. No doubt we’ll be seeing more team ups, mentions of the multiverse, and great nods to the DC Universe as the show goes on. The Flash airs every Tuesday on The CW and on international channels like Jack TV and Warner TV on their respective schedules. Previous articleUNGEEK PLAYS: UNTIL DAWN (EPISODE 1) IS OUT!